Are you worried that a tree on your property might be diseased or dying? It’s smart to be concerned about these things as unhealthy trees are more likely to fall during wind storms. The following warning signs for common tree diseases should help you determine if your tree needs help. If you notice these issues, contact us right away and we’ll help you with treatment or removal. 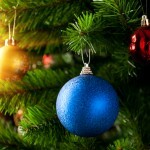 First, just give your tree a visual inspection. Are there discolored leaves? Is it losing leaves prematurely vs. other trees of the same species? Those could be signs that something is wrong. Also look for soft spots, open wounds, fungi or rot. If you see any cracks in the branches or trunk, this is a sign of serious structural problems that could be caused by disease. 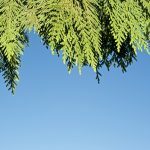 Essentially, keep a look out for “The Three Ds.” Disease, Damage, and Death are all indicators that it’s time to call a certified arborist for help. To check for unapparent tree death, perform a simple twig test. Break off a twig and see what it looks like on the inside. As long as the tissue is green the tree is still living, but if it’s dark and brittle, that twig is dead. If you find one dead twig, check other twigs and branches to determine whether the entire tree is lost. After performing the twig test, if you discover healthy tissue it’s critical that you cleanly prune the branches you have broken off as improper wounds will attract more diseases and pests. If you’ve found a mixture of dead and healthy branches, you’ll need to remove the dead wood as soon as possible. When working with mature trees, it’s recommended that you call a professional as we have the knowledge needed to effectively heal and remove them. Some trees just live longer than others. For example, various ornamental fruit tree species (like flowering cherries) may only live to be twenty-five or thirty years old, while Douglas firs and Giant Sequoias can live for hundreds of years. If you suspect that one of your trees is reaching the end of it’s golden years, call Inexpensive Tree Care for a possible removal. Don’t wait for Mother Nature to fell it for you. There’s a fungus common to the Portland area and Pacific Northwest Region overall. It’s called anthracnose, it loves wet weather, and its spores are easily spread by wind. When attacking trees, the fungus can cause leaf discoloration and defoliation, especially if the tree is stressed by something else like pests or poor pruning. Other tree species like oak, sycamore, dogwood, and Japanese maple are also susceptible to anthracnose. It’s just one of hundreds of pathogens and pests that could potentially harm your trees. For an accurate diagnosis, it’s best to consult a tree care professional. If you are concerned about a possible disease that is infecting your trees, it is crucial to identify the disease before a solution can be found. There are many varying diseases that can harm your trees and shrubs, and several methods used to control them. Fungicides are regularly used to control tree diseases. They can be sprayed, injected into the tree trunk, or even injected into the soil surrounding the roots. In some cases, tree pruning, fertilizing, or changing watering habits is all that is necessary to reduce infection for certain tree diseases. If you are thinking about attempting to control a disease that is infecting your trees, please contact us. We can identify the disease and give you advice about treatments that are available to control the disease and the proper time to apply them. To help you identify what is infecting your trees, we have listed four common tree diseases and the symptoms to watch for. Anthracnose infections in trees are common throughout the Eastern United States. 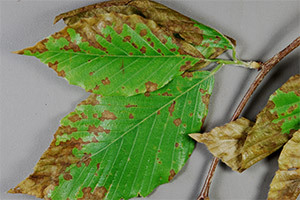 Many shade and ornamental trees are susceptible to the anthracnose disease including ash, basswood, birch, catalpa, dogwood, hickory, horsechestnut, tuliptree and black walnut. The infection can be particularly severe on American sycamore and several trees in the white oak group. Anthracnose is a host-specific disease, meaning the species of fungi that attacks your ash tree will not also attack your birch or sycamore tree. Therefore there are numerous recognized species of the fungi. Dothistroma needle blight is a fungal infection that causes premature defoliation in mature trees and severe stunting and death in young trees. It has been detected in more than 35 pine species throughout North America. 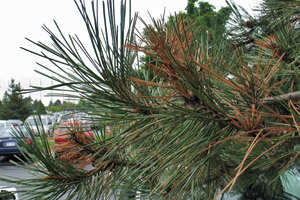 In Washington, Oregon and California, dothistroma infects plantings of lodgepole and Monterey pines. Early symptoms of dothistroma include darker-green bands and yellow and tan spots on needles. The dark green bands do not last long and will be missed if not observed at the onset of the infection. Over time, the spots and bands turn brown or reddish brown. Along the West Coast and into Idaho, dothistroma is often referred to as the “red band disease” because the bands on the needles are more red and numerous than they are in other regions. A dothistroma needle blight Infection is typically most severe in the lower crown of the tree. Armillaria root rot attacks trees and kills shrubs, vines, and forbs in every state. Hundreds of plants are susceptible to this disease to a certain degree. In fact, there are only two kinds of trees that are resistant to armillaria root rot: larch trees and birch trees. 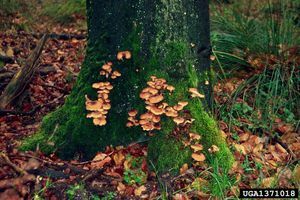 The fungi infect healthy trees, either killing them directly, or weakening them and making them more vulnerable to infestations by pests or other fungi. This type of fungus lives as a parasite on large roots and stem pieces of conifers and broad-leaved trees, and may survive there for years causing death, decay and growth reduction. It is also one of the most common fungi in forest soil. Serious losses have occurred in orchards and vineyards planted in recently cleared forest lands or plantations. All infected hosts show symptoms common to armillaria. One of the most noticeable indicators of an Armillaria infection are the clusters of mushrooms will also form at the base of the infected tree. Other symptoms include the appearance of lighter, bleached wood, yellowing foliage, and dieback of twigs and branches. The trunks of coniferous trees will excrete excess resin, which will result in a layer of resin, debris, and fungal tissue covering the infected roots. Deciduous trees can sometimes develop sunken cankers on the trunk. Removing the bark will expose the branching, vegetative part of the fungus. 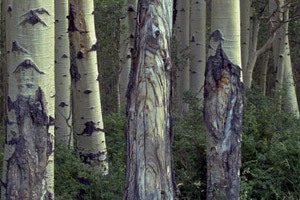 Quaking aspen trees are one of the most well-known and widespread species of tree in the Western United States. The majority of damage to aspen are caused by wound-invading fungi. One of these fungi is called sooty-bark canker, which is the most lethal aspen canker in the West. Sooty-bark canker is considered to be the most serious canker among tree diseases because it occurs on the larger trees on all sites. It is most often found on mature trees of 120 years or more, but can kill all sizes of aspen trees, usually within 3 to 10 years. The fungus attacks trees through their wounds and invades the inner bark, developing rapidly. Sooty-bark canker can extend as much as three feet in length and one foot in width in only a year. The cankers will initially appear on the bark as a sunken oval-shaped area. 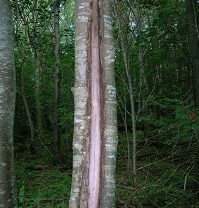 The fungus kills portions of bark each year. After two or three years, the dead bark will begin to slough off and expose the blackened, sooty inner bark that gave this canker its name.